Abstract: While synthetic siRNA libraries are powerful tools for functional genomic screens, off-target effects mediated by siRNA seed interactions with the 3' UTR of unintended targets can result in false positives. Given the frequency of off-target effects in some assays, the development of hit validation/stratification strategies is imperative. In the following study we have compared two strategies for identification of high confidence hits: 1) a multiple reagent approach where two or more individual siRNAs induce the same phenotype and 2) a chemical modification approach where hit confirmation is achieved using pools of siRNA that contain specificity enhancing modifications. A comparison of these two strategies (using a collection of primary hits generated from a cell viability screen) reveals significant overlap between the high confidence hits identified. However, for low confidence hits, i.e. where a single siRNA induces a phenotype, the concern is that an important hit will be missed. To determine if the phenotype is due to gene targeting or a seed-mediated off-target effect, a chimeric approach was used whereby a gene-specific seed sequence is introduced into a non-targeting siRNA scaffold. 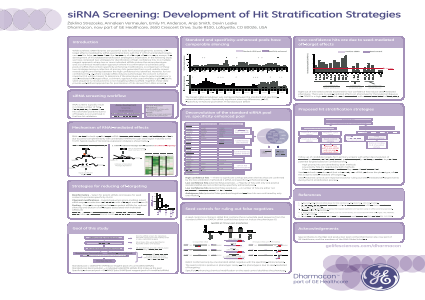 Together, these data provide well-defined approaches for prioritization of hits derived from RNAi screens.Summary: This poster compares different approaches to hit stratification and validation after an initial screen. Standard siRNA reagents deconvoluted from a pooled set of four were compared to a pooled set of four specificity enhanced reagents. High confidence hits were similar. To explore the validity of low confidence hits, a chimeric approach was used whereby a gene-specific seed sequence was introduced into a non-targeting siRNA scaffold. This work resulted in new hit stratification strategies.References: A. Reynolds, et al., Rational siRNA design for RNA interference. Nat. Biotechnol., 22(3), 326-30 (2004). A.L. Jackson, et al., Position-specific chemical modification increases specificity of siRNA-mediated gene silencing. RNA. 12.7,1197-1205 (2006). K.J. Simpson, et al., Identification of genes that regulate epithelial cell migration using an siRNA screening approach. Nat. Cell. Biol. 10, 1027-1038 (2008). A. Birmingham, et al., 3' UTR seed matches, but not overall identity, are associated with RNAi off-targets., Nat. Methods. 3.3, 199-204 (2006).